(Tech Xplore)—A team of researchers working at Harvard University with assistance from other scientists across the globe has succeed in creating a soft robot that mimics the swimming style of a real stingray—and it is guided by light. In their paper published in the journal Science, the team describes the journey they took in creating the robot, what they learned, and why they believe the new technology may eventually lead to a way to create artificial hearts. The impetus for developing the biohybrid was to learn more about ways to construct an artificial human heart—that is the specially of team lead Kit Parker. While at the aquarium with his daughter he noticed the similarity between the muscles a stingray used to propel itself through the water and muscles used by the human heart. Turning that insight into a swimming soft robot, the team notes, was a four-year journey into new territory that started with dissecting stingrays. 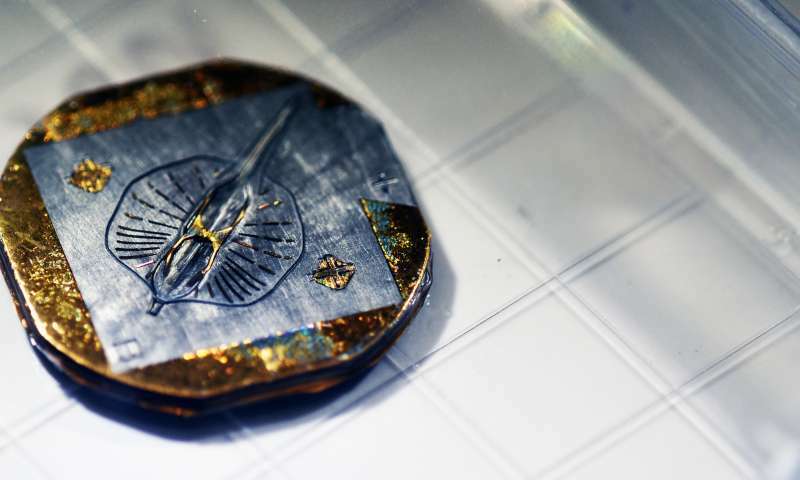 The finished product was a very small soft robot, less than the size of a penny—but as can be seen in a video the team created, it is able to swim like a real stingray through a liquid salt and sugar solution (which serves as food for the heart cells) guided by a blue light held in the hand of a researcher—marking yet another step forward in robot technology and perhaps a milestone in developing an artificial heart. 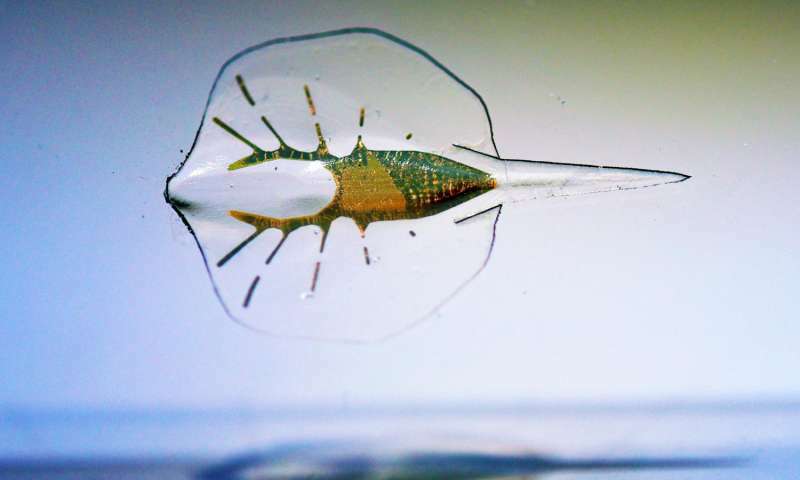 Inspired by the relatively simple morphological blueprint provided by batoid fish such as stingrays and skates, we created a biohybrid system that enables an artificial animal—a tissue-engineered ray—to swim and phototactically follow a light cue. By patterning dissociated rat cardiomyocytes on an elastomeric body enclosing a microfabricated gold skeleton, we replicated fish morphology at scale and captured basic fin deflection patterns of batoid fish. Optogenetics allows for phototactic guidance, steering, and turning maneuvers. Optical stimulation induced sequential muscle activation via serpentine-patterned muscle circuits, leading to coordinated undulatory swimming. The speed and direction of the ray was controlled by modulating light frequency and by independently eliciting right and left fins, allowing the biohybrid machine to maneuver through an obstacle course.